Peter has transferred the field experiences gained out on Dartmoor to Western Australia where he now works as an Exploration Geologist. Current employer: Novo Resources Corp.
After graduating from Plymouth I went straight onto a masters degree studying Mining Geology at Camborne School of Mines. I have held various placement roles, such as two weeks experience at SRK Consulting as a Student Geologist/Geotechnical, five months at Novo Resources as a Student Geologist, and two months as a Geologist as part of the Geochemical Baseline Survey run by the British Geological Survey. 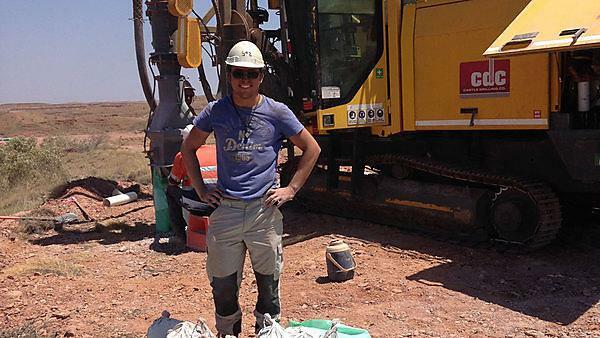 I now work as an Exploration Geologist at Novo Resources. The best part of my career is having the opportunity to travel around the world whilst working on many different ore deposits. I am currently working in Australia, which has been a really great experience. Try and get as much field experience as possible: the interviewer will want to see evidence you can work effectively in the field in a range of conditions and that you are able to work well in a team. My favourite memory from my time studying at Plymouth has to be the freedom I was given to choose from a variety of interesting dissertation projects and getting to travel and work in Castellane in the south of France with a great group of friends. Yes, if you’re interested in geology, Plymouth is a great place to study. The staff are very supportive, the material has a strong practical base, and there are a lot of field trips which will help you become a more confident geologist and ultimately help you get a job. Yes. Work hard and don’t be disheartened if you can’t immediately find a job in the field of work you desire, you will pick up valuable and transferable skills whether it be in Engineering Geology, Petroleum Geology or Exploration Geology which you can apply in the future. If you can’t think of any other aspects of geology you want to work in, then perhaps think about further qualifications which will put you ahead of the game in years to come.